Grapevine, TX (April 17, 2019) – At 1:30 a.m. on April 17, emergency crews responded to the scene of a hotel fire at the Embassy Suites Hotel. The hotel, which is located in the 2400 block of Bass Pro Drive, had light smoke rising from it when firefighters arrived at the scene. Smoke from the fire caused the second-floor sprinkler system to go off, which helped drastically prevent the spread of the fire. Crews worked to clear the fire from the building, allowing guests to re-enter within an hour. One person was injured in the fire and transported to an area hospital for medical treatment. We hope the individual injured in this fire is able to make a full recovery from their injuries. Our thoughts are with them at this time. In Texas, nearly 16,000 victims are injured in fires annually while another 3,000 lose their lives in these horrific incidents. Fires can leave victims to suffer excruciating pain and often results in permanent damage to nerves and scarring. When victims are injured in hotel fires, they may be able to file personal injury lawsuits against the property owners. 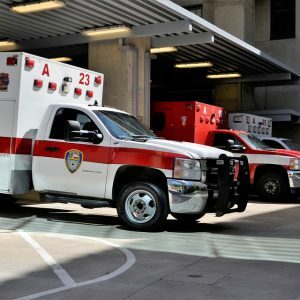 Accident injury attorneys in Texas work to help those harmed get compensation to cover medical treatment, lost wages, and various other costs incurred as the result of these incidents. The Benton Law Firm’s personal injury attorneys in Texas work aggressively to ensure those harmed get the compensation and justice they deserve. Our firm has successfully helped numerous clients collect millions of dollars to cover damages incurred from their incidents. If you were injured in a fire, contact our Texas burn injury attorneys at (214) 219-4878 to see what legal options are available for you.